Okay,I confess,I am reviewing this at the suggestion of Garden Lust Journal(http://mendogardens.blogspot.com/) and I was,to say the least, skeptical. I am allergic to these guys- they actually intefere with my breathing. So, as I said, I was skeptical. But this is a great book! Not just an animal story- but the story of a remarkable town. A town that burns down in 1931 because a kid was careless with a sparkler- but no one will say who he is- electing instead to go forward with rebuilding, renewing.The farm crisis of the late 1970's devastates the town economically and they are in kind of a rut when into their lives walks Dewey, the Small Town Library Cat. No hat like Dr. Suess' "Cat In The Hat"- but with a bag of emotional tricks that would make Felix the Cat envious. This little fellow has been tossed into a library return bin on a cold (-15F degrees) night in Spencer,Iowa. 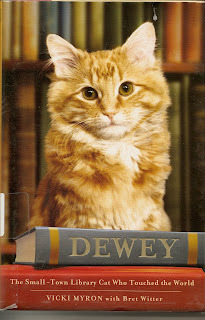 The author saves him and he becomes the official mascot of the library, winning over everyone- even people like me with allergies to these guys are rooting for him. I know I was. The author keeps you engaged by interweaving her own life with that of the cat and the history of the town. You really like these people. They are imaginative and resilient, always bouncing back. The antics of this little guy and his attempt at independence by running away will have you laughing. On the other hand, his recognition of the needs of others gives him an almost human dimension. He befreinds the local elementary school Special Ed class but attaches himself to the most needy of the children- and the results are tangible- the girl, confined to a wheel chair- glows. Through the authors own struggles as a single mother while battling breast cancer and a double mascetomy the bond between the two is forged. The relationship with her own daughter is a direct result of Dewey- through his presence they found a bridge. It later becomes apparent that Dewey is ill and things are not going to end well. And they don't. But through it all the author cares for Dewey until the very emotional ending, as the town first mourns his loss, and then learns to rejoice in the legacy he has left behind. It is a tear jerker in parts towards the end, but the tears are ones of grief as well as joy. It is hard to say this, but I am better off for having read this book.